Having missed the airport yesterday, I found the airport the next day (Monday 19May08). There certainly is a very limited amount of buildings on this 'airport'... 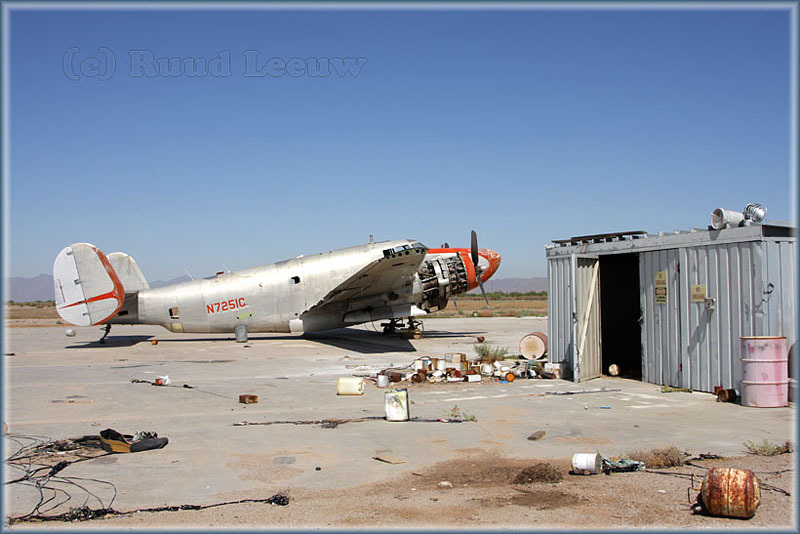 There is this hangar, with N7086C parked outside, within an enclosed area. But soon after I took this photo, a guard stepped outside. He was very understanding, even mentioned the name 'Propliners' himself, told me not to drive to the other aircraft for fear of getting a flat tire (much rubbish around from previous scrappings) and show respect for the owners, the Indian community. 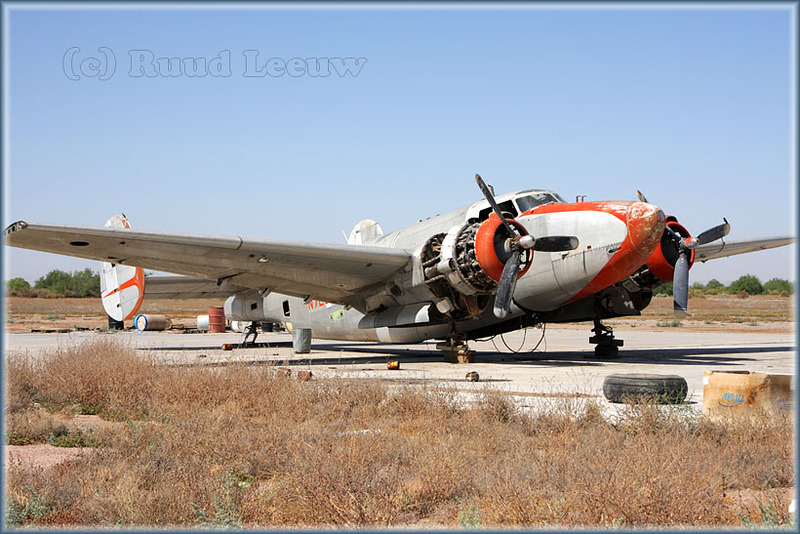 N7086C is a Lockheed PV-2 Harpoon with c/n 15-1410. It was sold in 1957 and tailnumber N7086C was assigned to it. 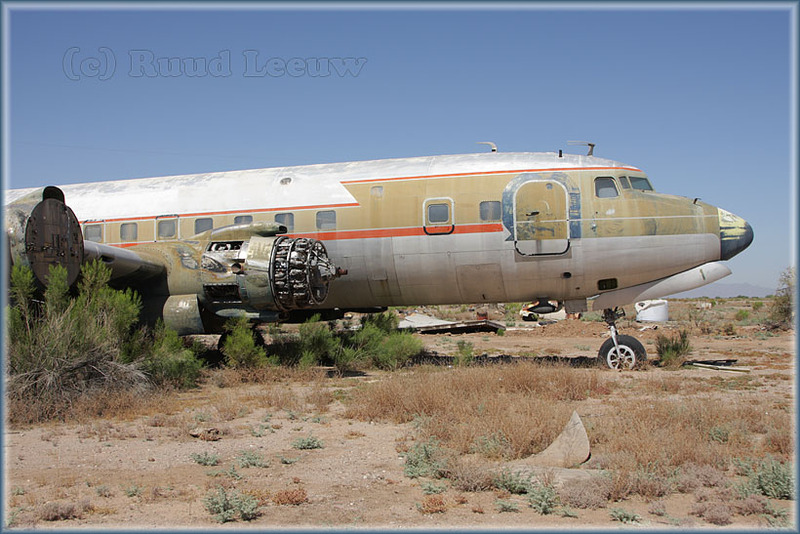 In 1961 it was sold to Larabee & Rabinette and converted to a 'Borate Bomber' to fight fires from the air. It had a fibreglass bellytank! 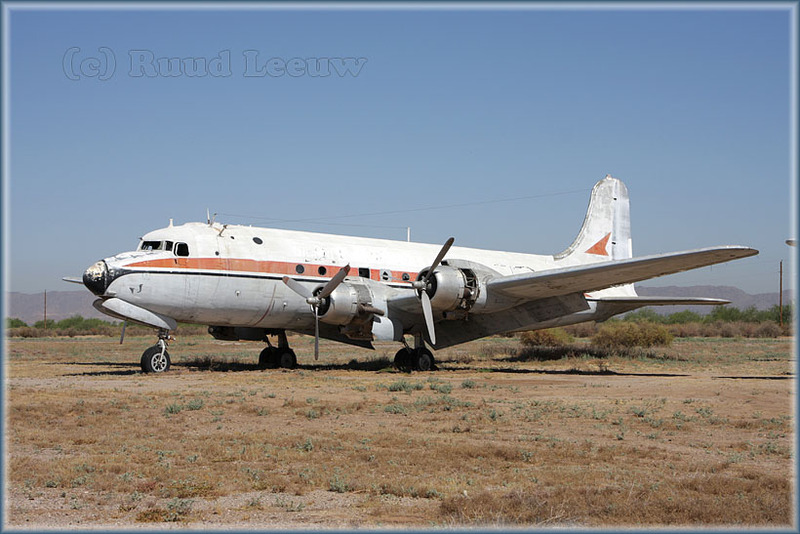 In this capacity it served B&B Flying Service ('D20') and later D&D Aero ('F43'). 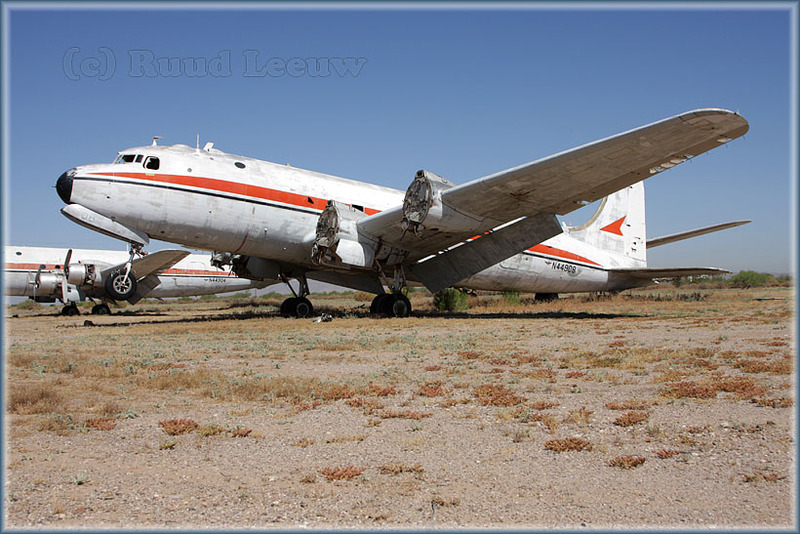 It was rebuilt with a RALCO metal bellytank and in Aug79 registered to RALCO with airtanker id '112'. Through various operators it ended up with T&G inc for the 1981 - 1983 seasons, then was stored here at Chandler. 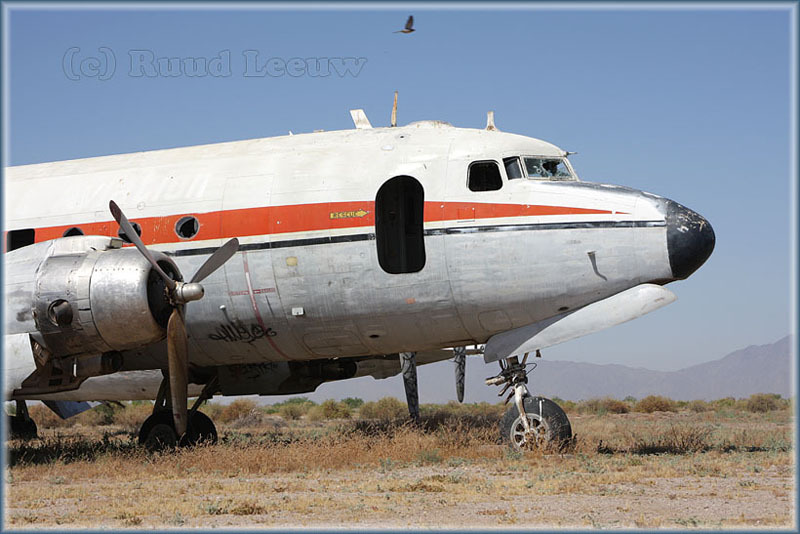 In 1985 it was registered to Military Aircraft Restorations Corporation in 1985. Source: The Lockheed Twins, written by Paul J.Marson (Air-Britain, 2001). PV-2 N7086C is no longer with MARC. 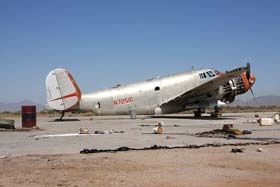 On 10Oct07 it was sold to William Dietzel of the United States Airpower Museum at Fresno/Yosemite Airport near Fresno,CA. 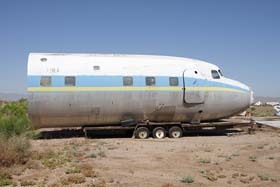 This probably explains why it was moved out of the grass and in front of the hangar earlier this year. It will most likely be transported to Fresno in the not too distant future. 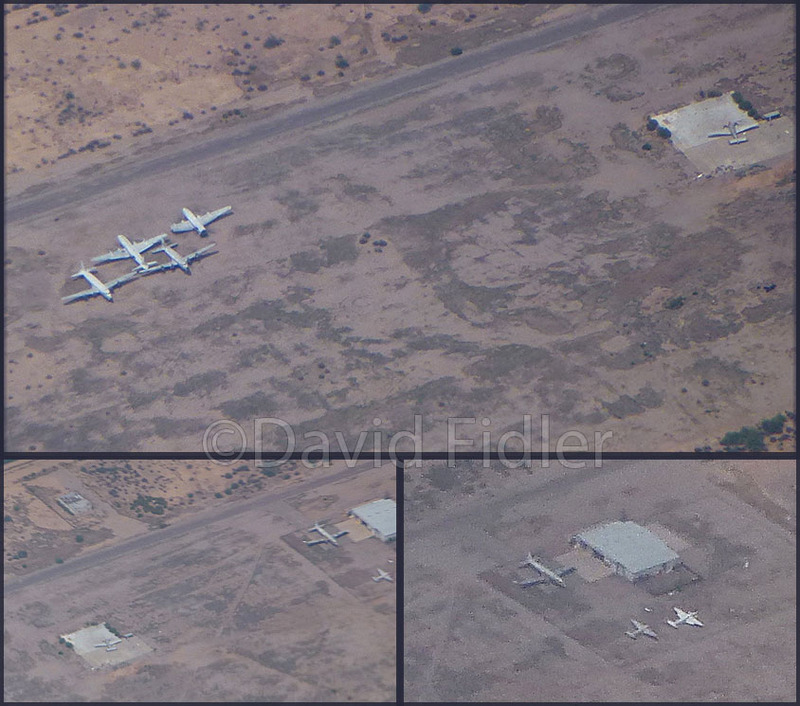 N7086C was probably still around here as Chris Pasley's photo on Flickr.com show two PV-2 Harpoons parked here (date shown there as 06Mar2010). 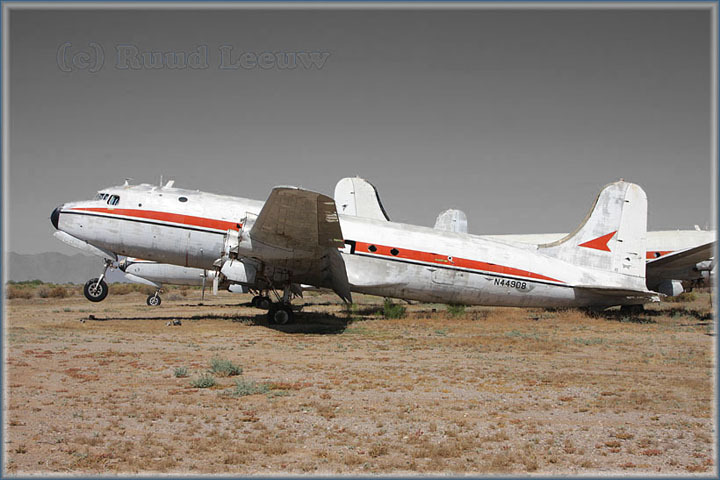 The other one is N7251C (see below). 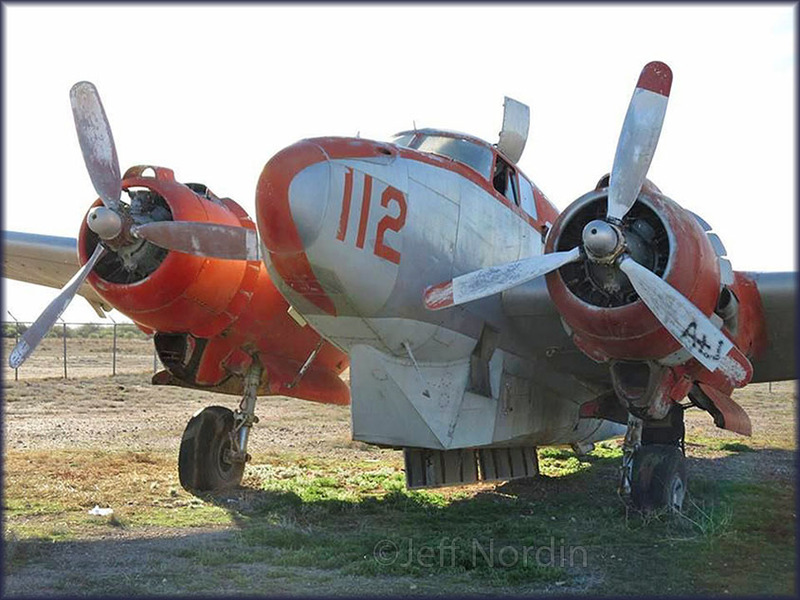 It was still around in Jan.2015, as this photo by Jeff Nordin (from Facebook 'Fire Bombers') illustrates. 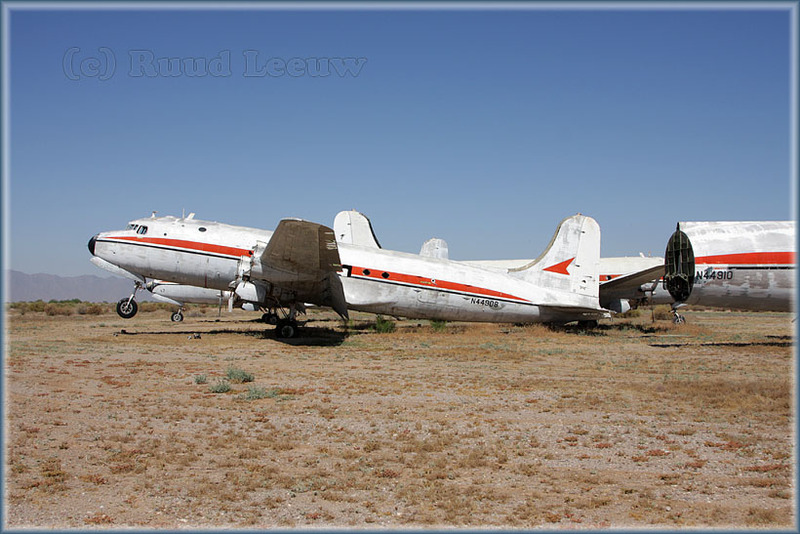 Jeff also wrote: "There were two other Harpoons there, four C-54s, and a DC-7." 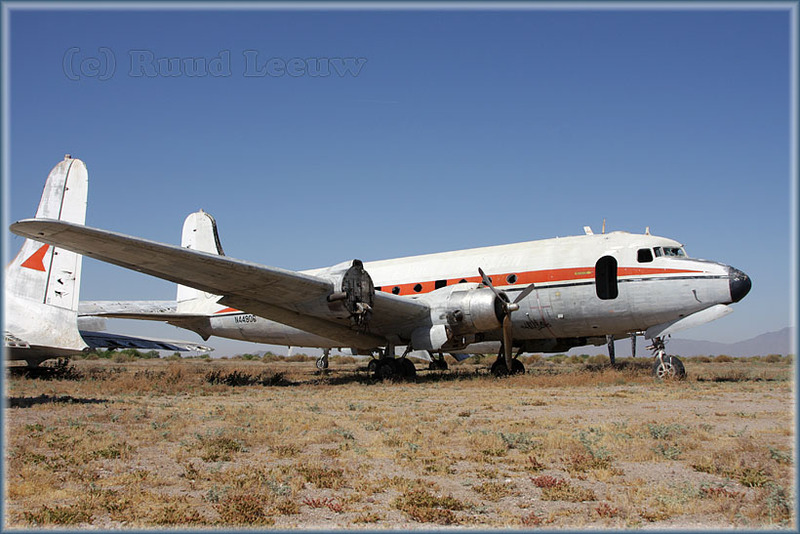 Four Douglas C-54's (military variant of the DC-4) remain here, operated a long time ago by Biegert Aviation. 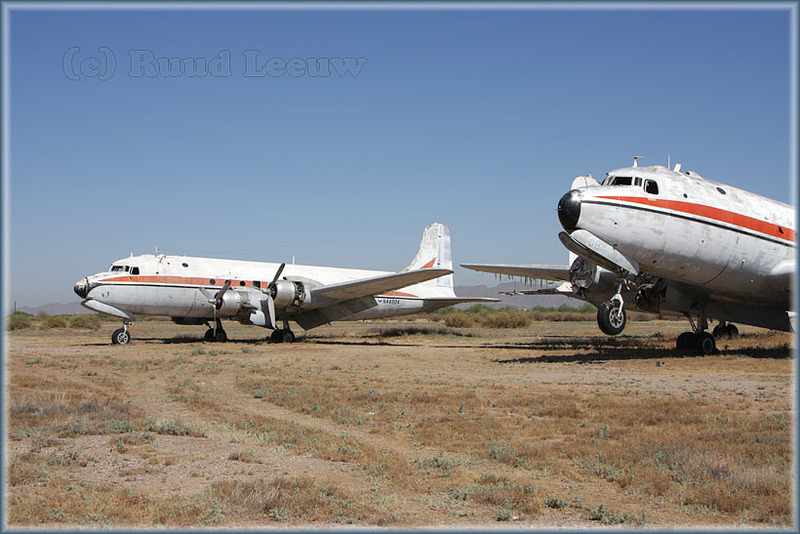 These 4 comprise N44904 (C-54D c/n 10862/593), N44906 (C-54B c/n 18388/162), N44908 (C-54B c/n 27246/192) and N44910 (C-54D c/n 10601/332). 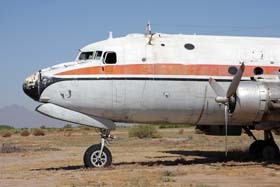 Biegert Aviation, which operated off and on from 1947 to 1983, was responsible for some of the largest aerial spraying operations on record. These included the Miami Beach Mediterranean Fruit Fly Project in 1956 where a photograph of the Biegert Aviation plane spraying the beach made the center spread of LIFE Magazine. Another claim to fame is the company's introduction of 4-engine spray technique. The Biegert's introduced B-17s to the art of aerial spraying, and Max actually rebuilt and flew the first B-17 Biegert Aviation ever used for this technique. 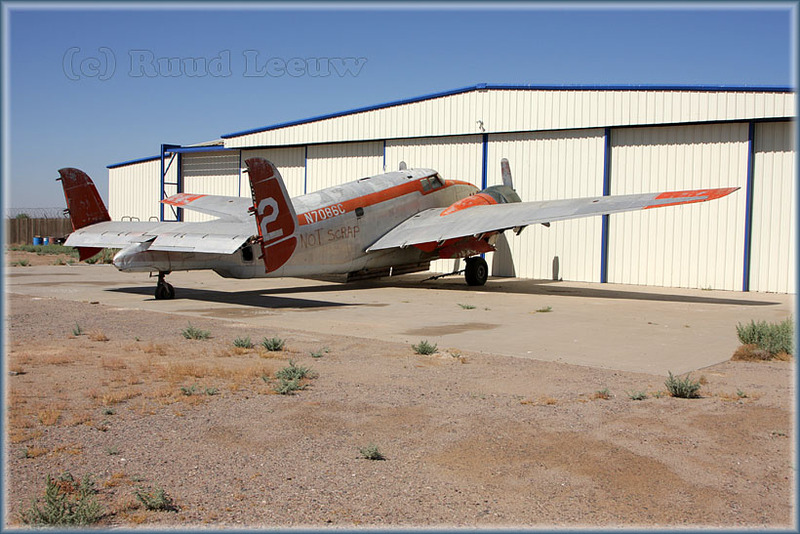 Max Biegert became a crop duster after World War II, using a beloved Stearman bi-wing and, unbelievably, a B-17 Flying Fortress -- the first-ever four-engine aircraft used for aerial-spray operations. 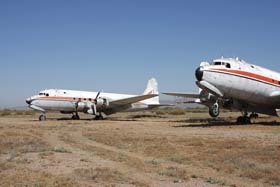 Biegert Aviation was formed in 1946, eventually converting a fleet of B-17s to accommodate many state and federal aerial-spray projects. 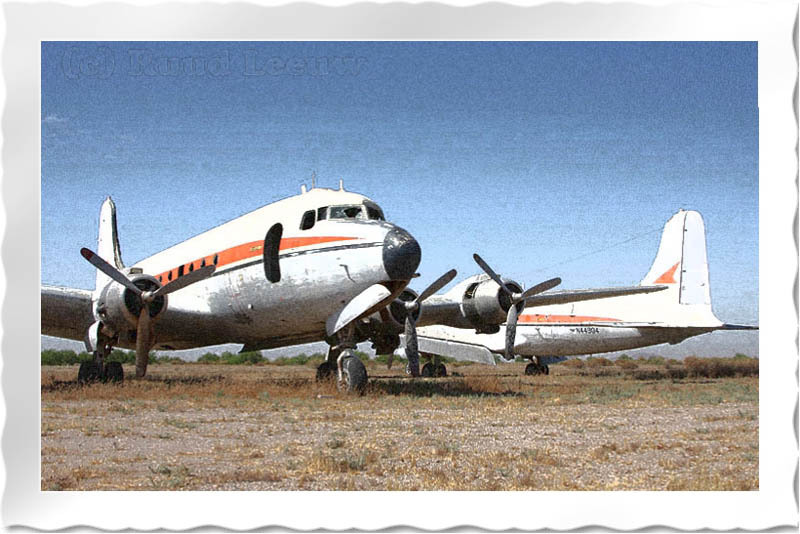 By 1975, Biegert Aviation modified a fleet of Douglas C-54s, which were used in an effort to help eradicate the Spruce Budworm from the pulp forests in the state of Maine and parts of Canada. The plague was conquered in 1982, restoring wood productivity once again to Northern Maine. Biegert's next legacy was in 1982 with the development and manufacture of the Airborne Dispersant Delivery System, wherein environmentally safe agents are used as a first line of defense against oil spills at sea such as was caused by the Exxon Valdez in Alaska's Prince William Sound. 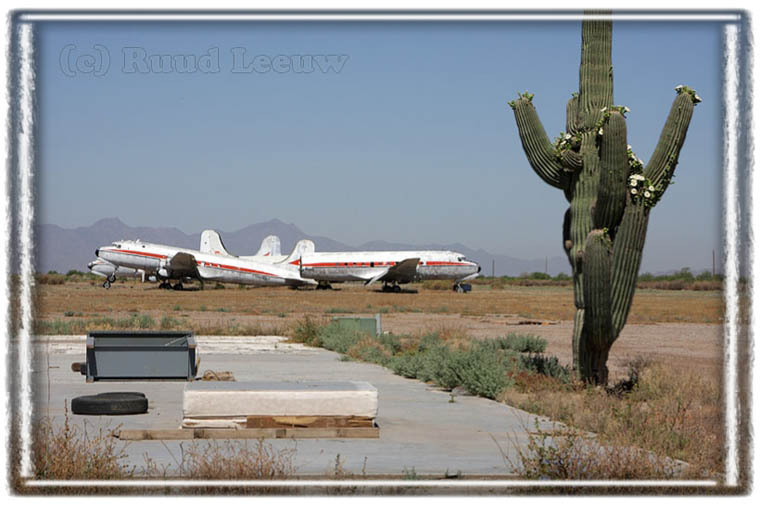 These C-54's remain as a tribute to Biegert Aviation here at Chandler's Gila River Memorial Airfield, but the Indians are cleaning this place out and the propliners are fast disappearing here. "I worked for Biegert and T&G from 1983 to 1987. 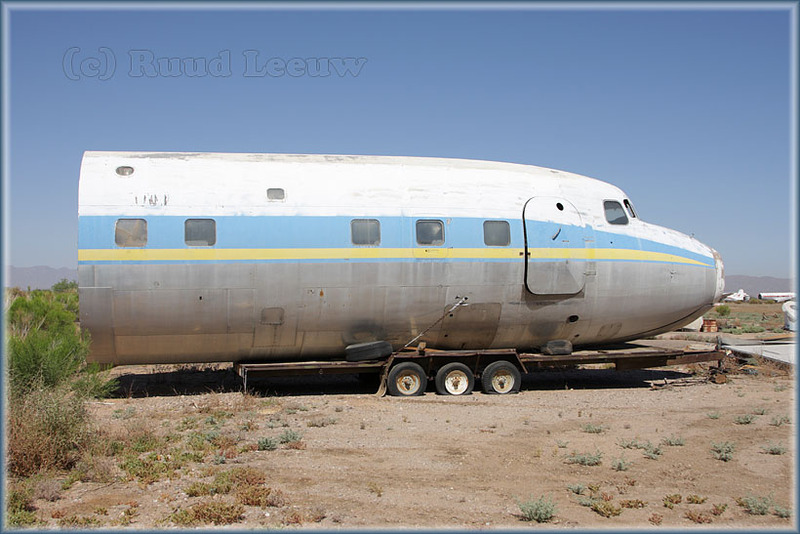 I know all those aircraft in the photos on your website intimately! 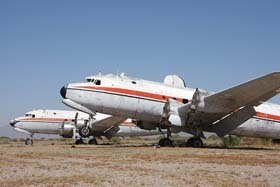 I was Chief Inspector for Biegert and worked on the DC-4's show (we had at least 9 DC-4's at the time). I worked for T&G in late 1986/87. 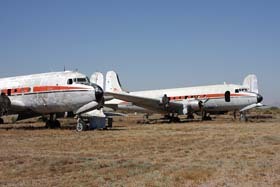 T&G had a large number of DC-7B and -C's when I worked there, as well as Lockheed 749, 1049 and a 1649! 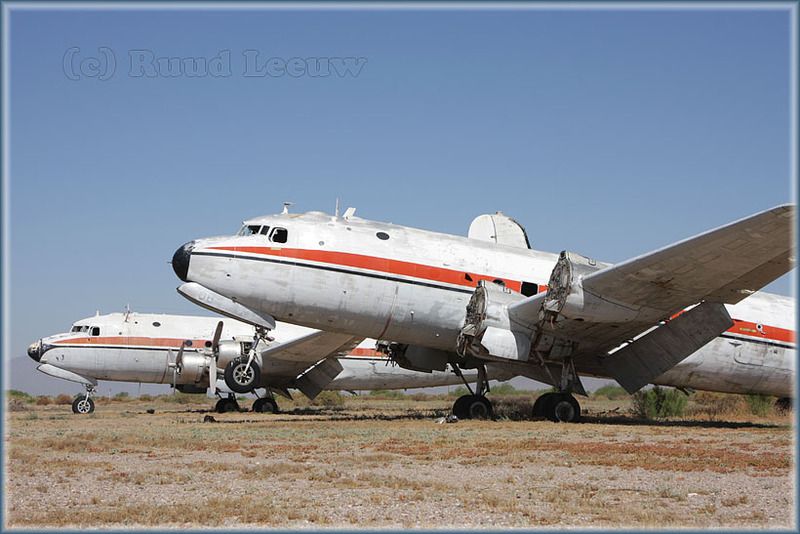 H-19's out back in the field, a large building out back by the POC DC-7 full of spares. 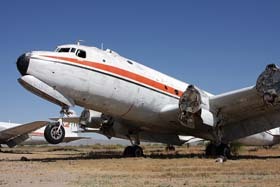 That Delta DC-7 never flew while I was there, but we routinely operated the other aircraft as fire bombers. Biegert's aircraft were all sprayers. 1984 was the last year for the Spruce Budworms in Maine, but we did go to Idaho and Grand Junction, CO in 1985 and spray grasshoppers." This airframe was delivered to the US Navy, designated a PV-2D with serial 37550 often quoted as its construction number) on 29Nov1945. 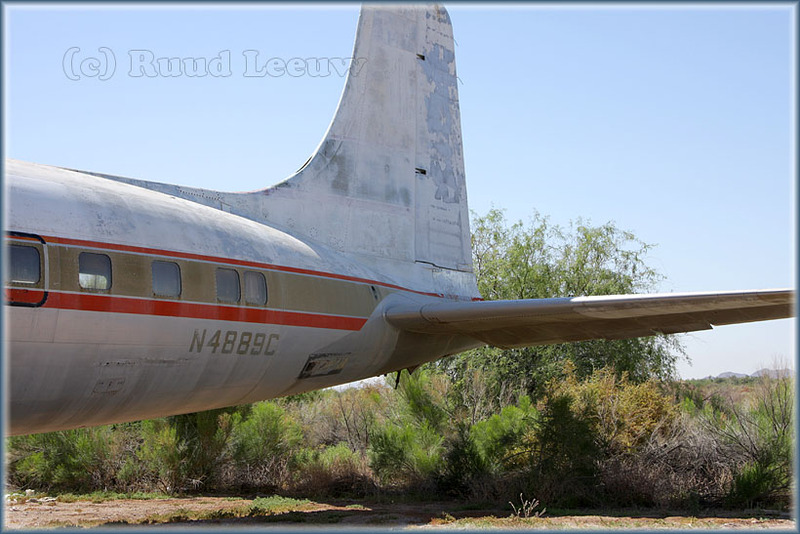 In 1946 it was stored and found a vast spot among the vast numbers of War Surplus aircraft on nearby Litchfield Park, west of Phoenix. 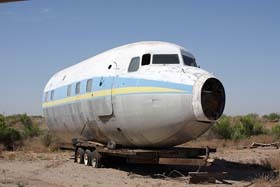 but it soon picked up its military career until stored again at Litchfield Park in 1955. 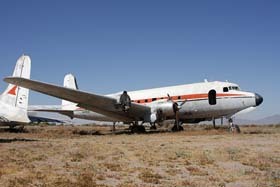 In 1957 it was sold and tailnumber N7251C was assigned to it. 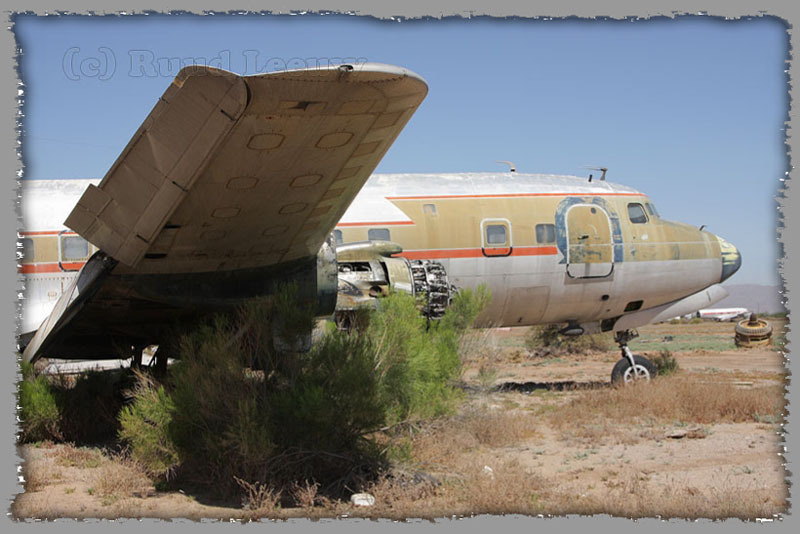 In 1961 it went to Southwest Aircraft Inc and was converted for civil use; during 1971 it was converted for agricultural use as a sprayer. 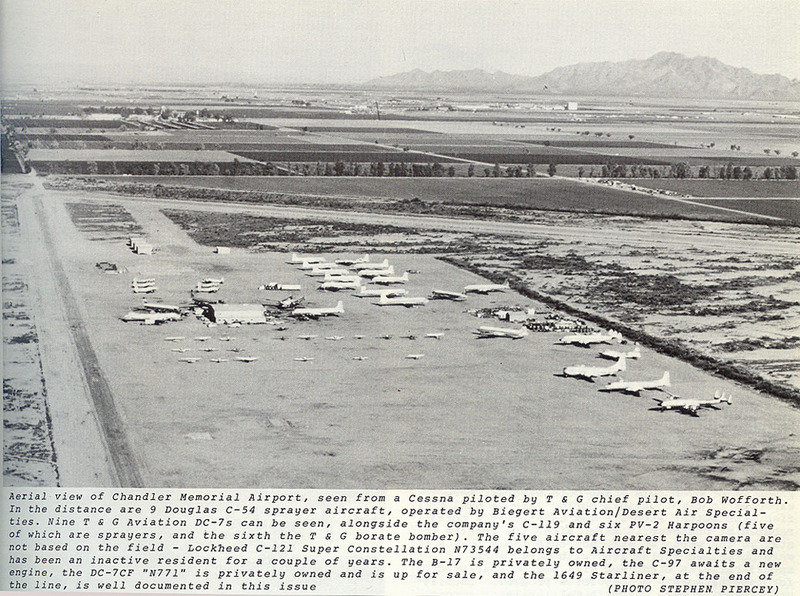 This ended when it was stored here at Chandler. Noticed on Flickr.com photostream by Chris Pasley that N7251C was still present here on 06Mar2010. The PV-2 Harpoon was a major redesign of the PV-1 Ventura with the wing area increased from 551 ft² (51.2 m²) to 686 ft² (63.7 m²) giving an increased load-carrying capability. The motivation for redesign was weaknesses in the PV-1, since it had shown to have poor-quality takeoffs when carrying a full load of fuel. On the PV-2, the armament became standardised at five forward-firing machine guns. Many early PV-1s had a bombardier's position, which was deleted in the PV-2. Some other significant developments included the increase of the bombload by 30% to 4,000 lb (1,800 kg). Another development was the ability to carry eight 5 in (127 mm) HVAR rockets under the wings. 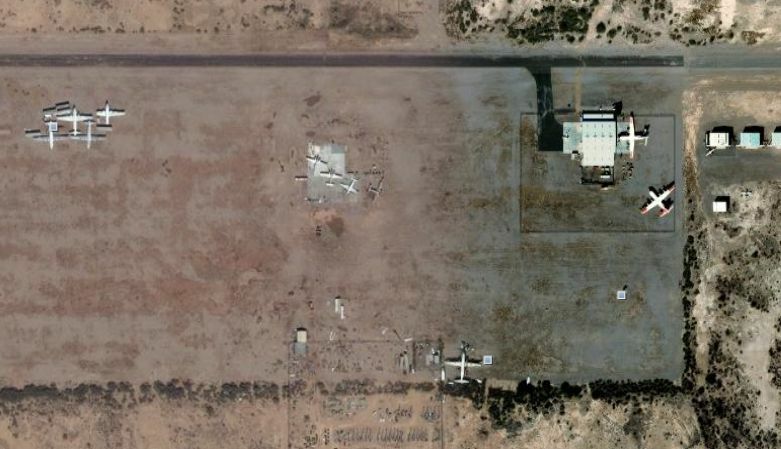 This is in fact still an operational airport, hard to believe, eh? During the early-1990s a lot more planes had their home here and I travelled these parts then but wasn't into propliners much. I regret not having been here then quite a bit... This may serve as an explanation that I went over to these planes when the guard asked me not to. I just had to get them on camera! 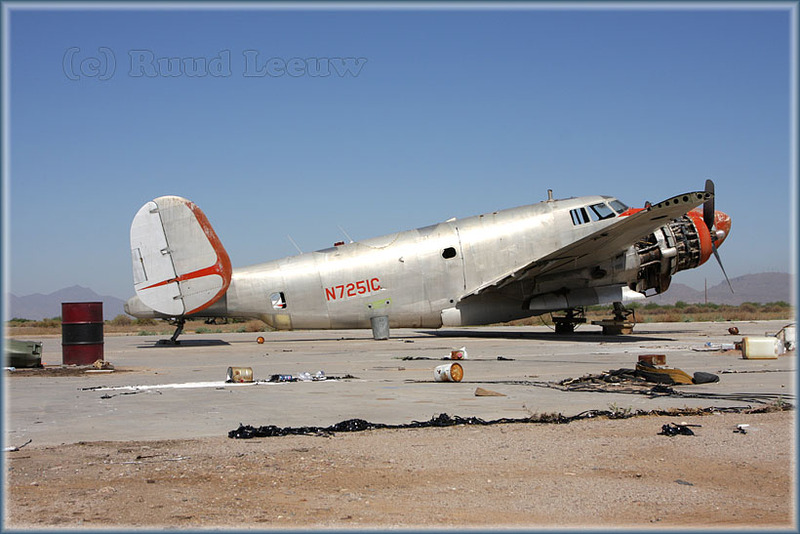 Below sits, what remains of it, N5902. 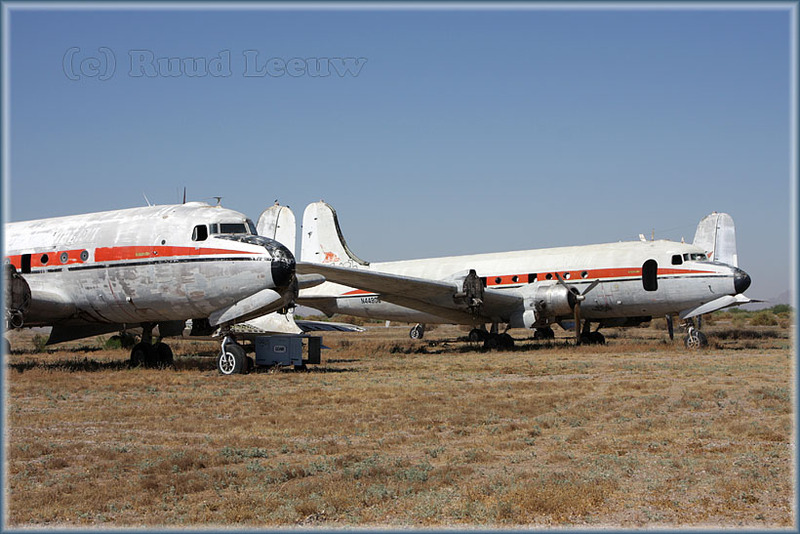 What was once a proud Douglas DC-7C 'Seven Seas', with c/n 45070.
formerly with T & G Aviation here at Chandler Memorial, it has been stored here since at least Feb97. 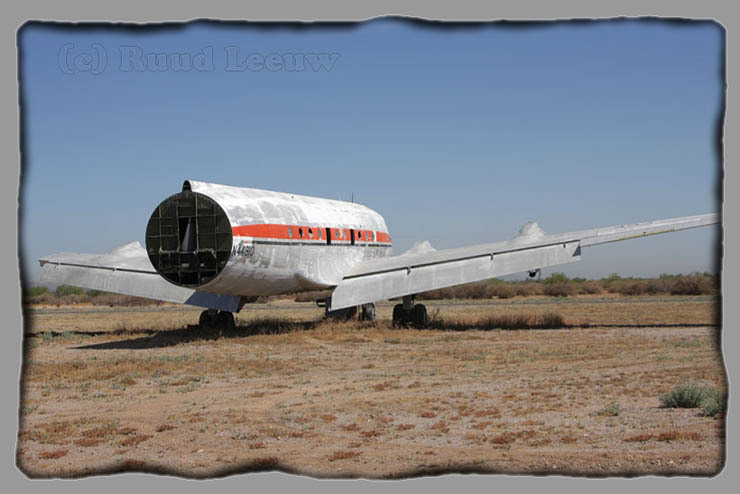 It also once flew with Braniff. 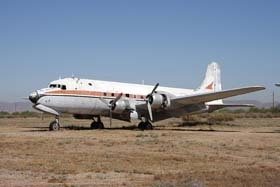 The livery is from its days with Ports of Call (based at Denver,CO) but it ended up being used as a classroom before going to T&G Aviation. 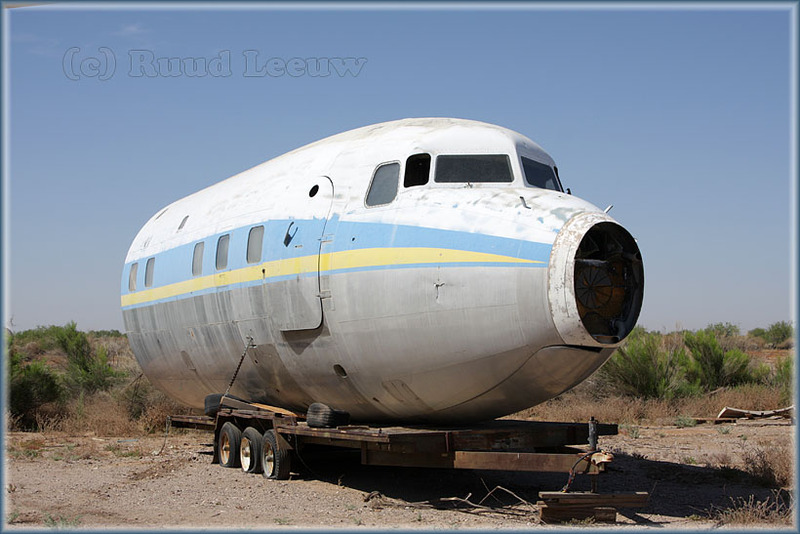 It was supposed to go to Maurice Roundy (of Starliner fame), and move to Florida, but that was in 2006. Jeff Whitesell wrote me in Feb06: "We released our interest in the airplane several years ago". 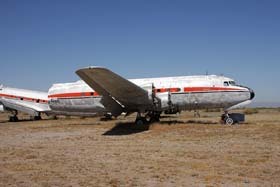 Aviation Letter (Jul08 issue) reported it to be sold to Scroggins Aviation of Las Vegas,NV in June 2008. 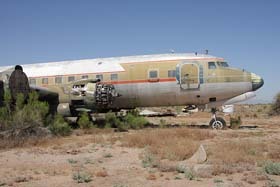 They dismantle aircraft but also use parts for films. Thanks for looking in on the old gal !" that I doubt it will ever bring in a penny anymore! See Friends & Guests (49). 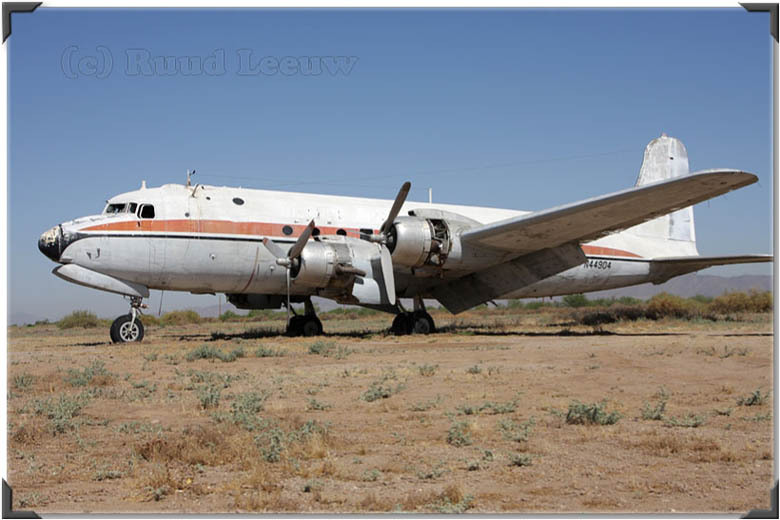 Mesa Police Department, Mesa, Arizona, is seeking information on the following theft of a dual axle low-profile trailer containing approximately 2,500 pounds of vintage Lockheed fixed-wing aircraft parts reported stolen earlier today. 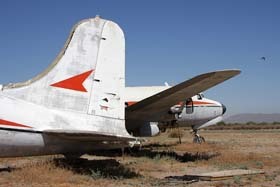 Items reported missing are 1940s and 1950s vintage Lockeed aircraft wings - most notably a complete 36' aircraft wing section from a T-33 trainer and starboard wing of a PV-2 Harpoon as removed from a locked and fenced storage compound located one block east of Mesa's Falcon Field municipal airport. 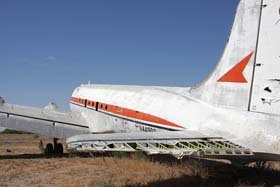 These vintage aircraft wing components were strapped to an open 28' trailer and stored in the 5600 block of East McDowell Road, just across the street from the airfield. The trailer was last noted at the site, 5601 East Hermosa Vista Drive, Wednesday, 09 July 2008. 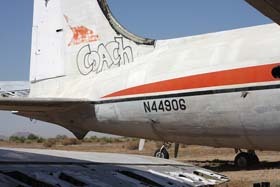 Items as stored on the trailer were visible from the ground and air and not covered on the vehicle. 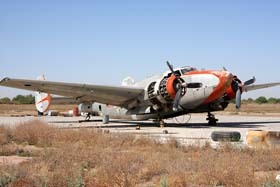 Aircraft wing is painted silver, and has a national "star and bars" insignia consistant with USAF aircraft on one wing. This wing obscures yet another Lockheed aircraft wing cradled underneath the upper wing section. Both components held on this open trailer with cargo straps. 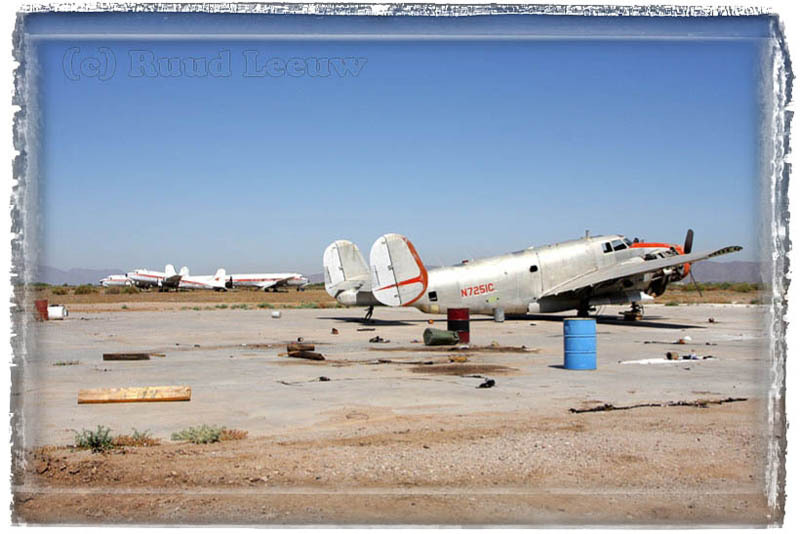 All items are considered property in care of Wingspan Aviation Heritage Foundation, a not-for-profit organization museum located in Mesa, Arizona. A $1,000 reward for the safe return of the items is offered. 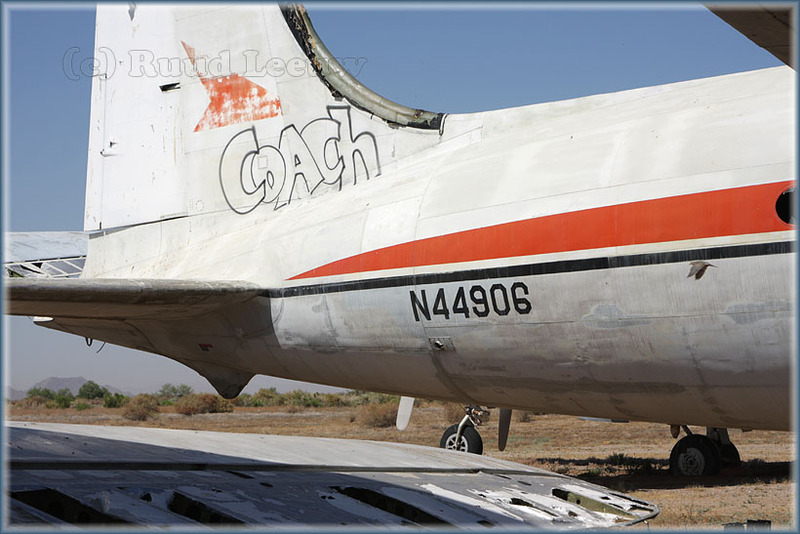 All area scrap buyers have been notified with negative results and it is now suspected that the motive for the crime may have been the theft of the commercial grade trailer and not necessarily the aviation related components stored upon it." 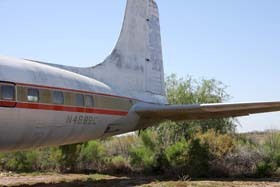 Robert Kropp, Director of aircraft acquisitions and restoration for the Wingspan Aviation Heritage Foundation of Mesa, received an anonymous tip which he in turn relayed to the police. This lead to the retrieval of the stolen parts. 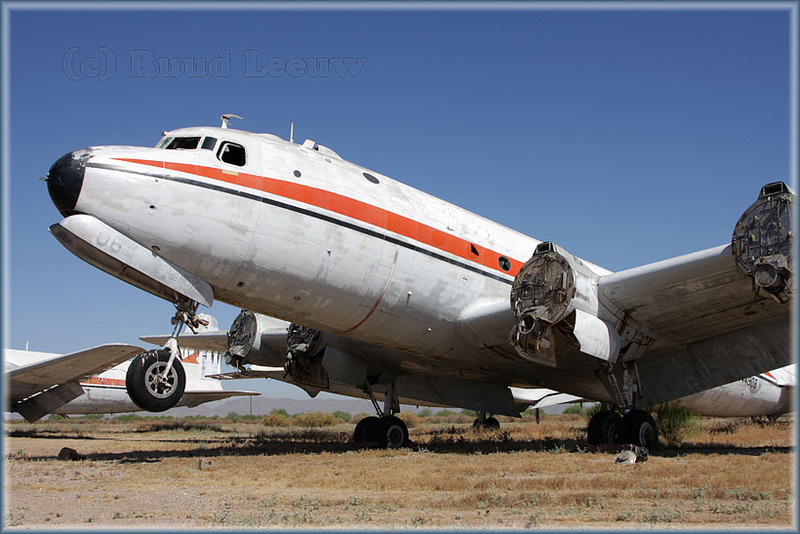 N7257C was trucked from Chandler Memorial to Mesa's Falcon Field on 27Dec07 and subsequently (dismantled) stored in a small hangar, out of sight and secure. This is an aerial photo of Chandler, made by Stephen Piercey, in 1981. Photo was published in Propliner magazine, Vol.11,1981. (Published with permission). Stephen Piercey' after the young and talented chief photographer of 'Flight International' who was tragically killed in a mid-air collision at the Hanover Air Show on 20th May 1984 whilst on an assignment. Stephen, who lived near Brooklands at Addlestone, had founded and edited a high quality, quarterly magazine called 'Propliner' devoted to Piston- and Turboprop transport aircraft around the world. 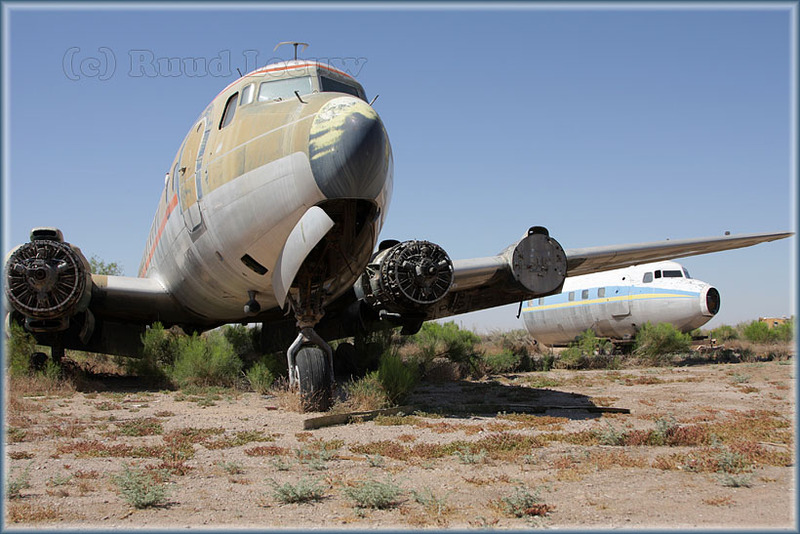 By March 2010 it seems only the C-54s are still there plus two PV-2 Harpoons. 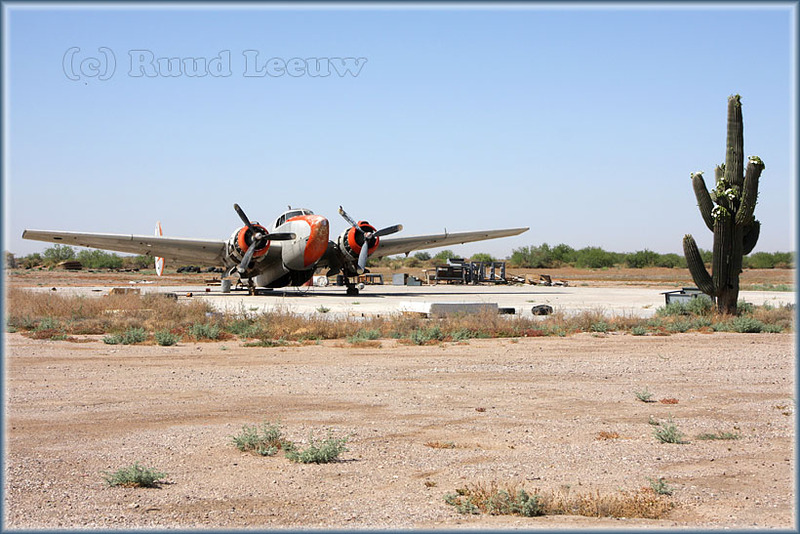 Nigel Hitchman wrote: "I was there in Feb. 2012 and didn’t see anyone; but it was a Sunday afternoon, the 4 Biegert C-54s sit out in the open and ones PV-2, the other PV-2, Howard 500 and DC-7 are in a fenced off compound, but standing on top of the car got good pics over the fence!" 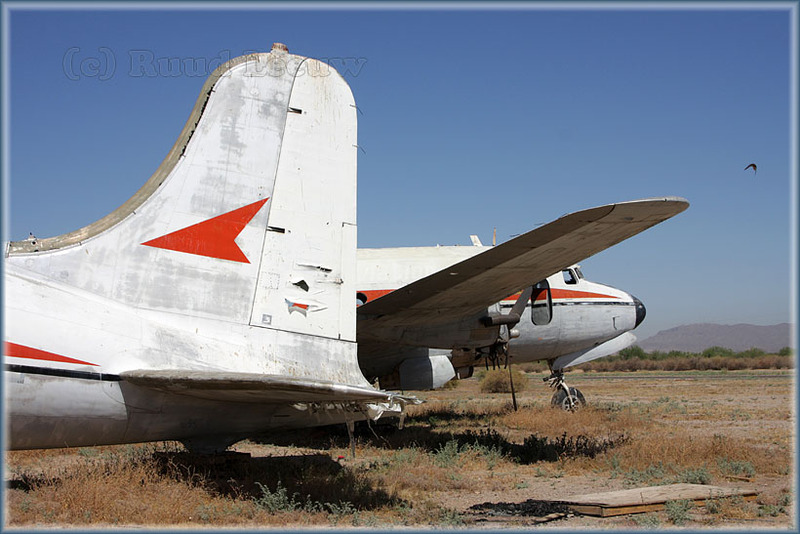 I was asked what the location was of a Howard 500: N130P (c/n 500-114), another longterm resident of Chandler, but apparently no longer present at Chandler upon my visit. 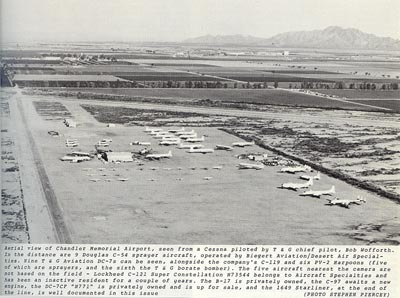 "As I thought, the Howard 500 is still at Chandler, in the hangar. 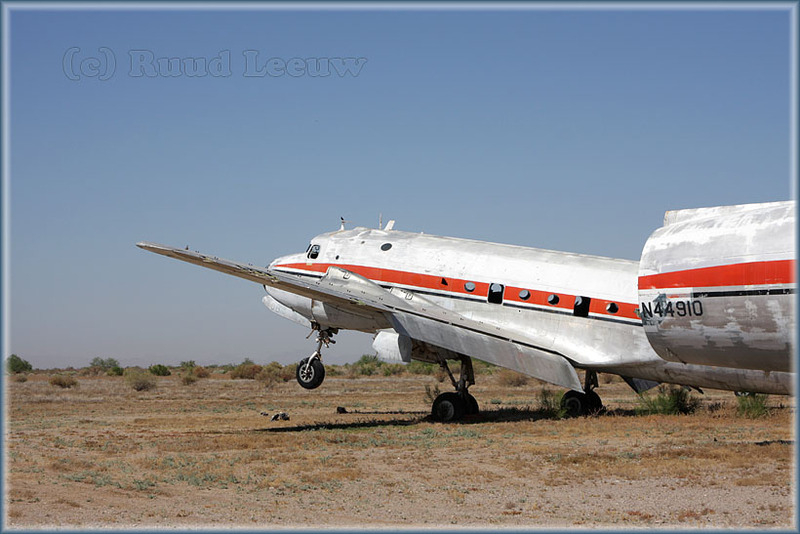 It had done some (probably only one on each) engine runs 18 months ago, but the local word is that it'll take a LOT of work to get it airworthy again; yet the owner still believes it can do it. As far as I am aware, work on it has stopped, but may resume if money/determination show themselves ... as well as suitably qualified folks to do it !" 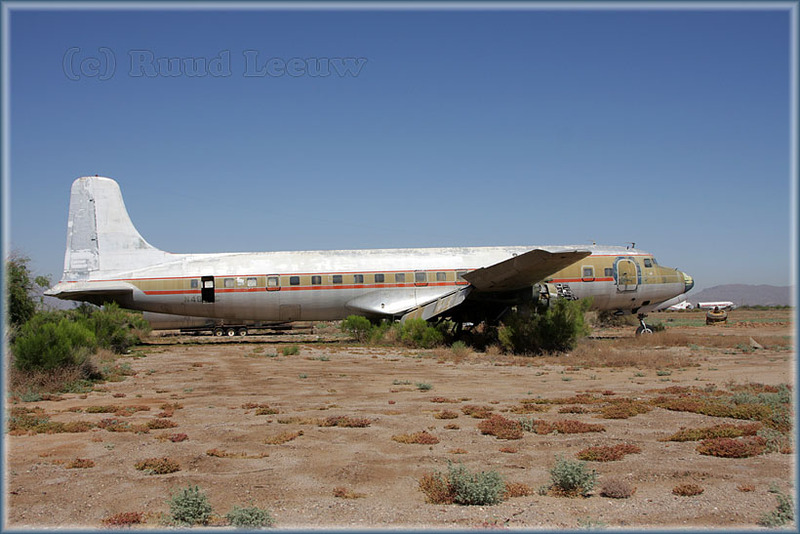 The Howard 500 was an executive transport aircraft produced in the United States in the early 1960s. During the 1950s and 60s, Howard Aero had been remanufacturing military surplus Lockheed Lodestars and Lockheed Venturas for the executive market, but while the Howard 500 bore a strong resemblance to these aircraft, it was a substantially new design, and all 500s had completely new airframes. David Fidler wrote me in Dec.2015:"I just read your page about Chandler Memorial (Gila River), a place I have been to quite a few times since my first visit in 1989! 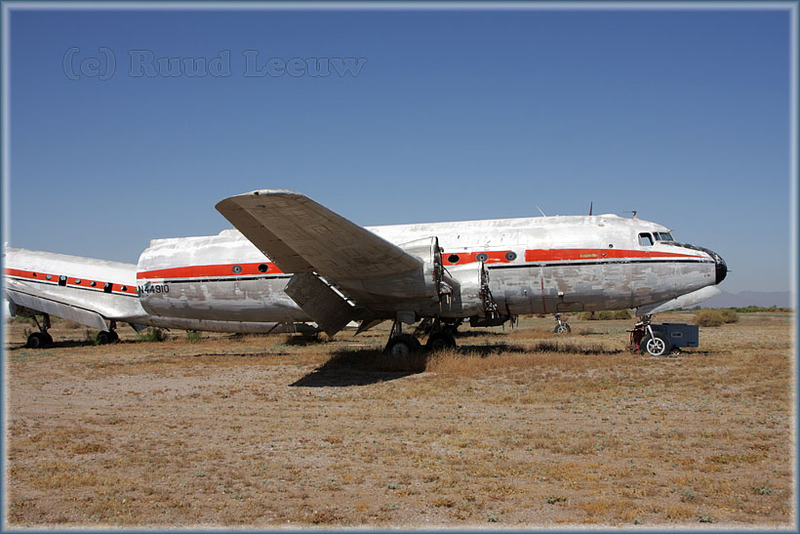 My last time was probably 10 years ago, when T&G were still there and all their old DC-7s still present. I flew out of Phoenix-PHX in July 2015 and was able to take these photos through the American B738 window. 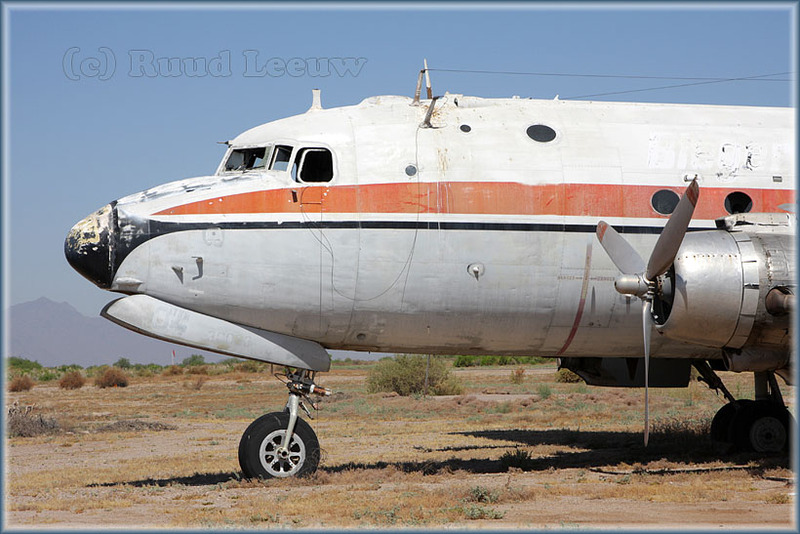 They show the Biegert DC-4s nave not changed since your photos in 2008 and there still seem to be two Harpoons plus probably the Howard 500 stored with the DC-7. These photo may show enough detail to recognise what is there." Thanks to James for allowing me to take these pictures!